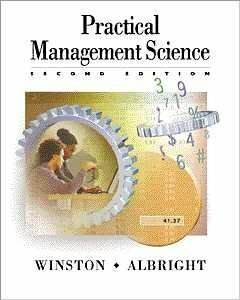 In the Second Edition of their popular text, Wayne Winston and Chris Albright continue to build on their highly successful approach of teaching by example while using spreadsheets to model a wide variety of business problems. The authors show the relevance of topics through numerous examples of real-world implementation of management science. The ideal solution for people who want to teach by example and who want to solve real problems with spreadsheets and professional spreadsheet add-ins, this text is always interesting, in part due to the useful cases added to this edition. Wayne L. Winston is Professor Emeritus of Decision Sciences at the Kelley School of Business at Indiana University and is now a Professor of Decision and Information Sciences at the Bauer College at the University of Houston. He has won more than 45 teaching awards, including the school-wide MBA award six times. His current interest is in showing how spreadsheet models can be used to solve business problems in all disciplines, particularly in finance, sports, and marketing. In addition to publishing more than 20 articles in leading journals, Dr. Winston has written such successful textbooks as OPERATIONS RESEARCH: APPLICATIONS AND ALGORITHMS, MATHEMATICAL PROGRAMMING: APPLICATIONS AND ALGORITHMS, SIMULATION MODELING WITH @RISK, DATA ANALYSIS FOR MANAGERS, SPREADSHEET MODELING AND APPLICATIONS, MATHLETICS, DATA ANALYSIS AND BUSINESS MODELING WITH EXCEL 2013, MARKETING ANALYTICS, and FINANCIAL MODELS USING SIMULATION AND OPTIMIZATION. He received his B.S. degree in mathematics from MIT and his Ph.D. in operations research from Yale.